Riser Recliner chairs are a fantastic product to enhance not only your lifestyle, but also your well-being. As well as providing great comfort, Riser Recliners assist in alleviating many symptoms from a range of common health problems such as arthritis and heart and lung disease. The chairs can also help with circulatory problems like pain, breathlessness, and stiff joints. To get the best out of your chair, you should use the functions (recline or raise facility) when you need them the most. On good days you may be more capable of sitting and standing from your chair in a more usual manner. Do this whenever you can as it will help you retain strong muscles and bones. On bad days however, let the chair assist you to keep active and reduce any painful symptoms you experience. We’re keen to help you make the very most of your new HSL furniture. It’s worth taking a little time to familiarise yourself with the functions on the handset, and to read the following guide. When using chairs of this type close to a wall, always ensure that you allow sufficient clearance behind the chair for the back to fully recline without restriction. Please check minimum clearance after installation. If used against a wall, electric models, in particular, can sustain serious damage which will be classed as misuse and will NOT be covered by your guarantee. After a period of time, it is advisable to lightly lubricate the recline and lifting mechanism with a general purpose lubrication oil, such as ‘3 in 1’. This will eliminate any slight creaking noise which may develop as the joints within the mechanism ‘dry out’. With particular regard to children and pets, please ensure that the back and under-space of the chair is free from obstruction prior to reclining or lowering. Ensure that the wire to your Riser Recliner chair is uncoiled and that the transformer is at least twelve inches away from the chair. Keep liquids well away from the electronic elements of the chair. Do not allow any liquids to come in to contact with the remote control. Any spilt drinks or fluids on the seat should be immediately removed to avoid possible contact with the electrics underneath. Remove power supply immediately. If you need to move your chair, only do so when it’s in an upright position. Make sure all wiring is free and not trapped in any way. Do not sit on the footrest. Children should not be allowed to operate the chair by themselves. Do not attempt to move the handset from one side of the chair to the other. Unplug your chair when not in use. When using a Riser Recliner always ensure the chair is returned to the seated position when it’s not in use. Do not attempt to move your chair without unplugging the mains lead – doing so may be dangerous and can result in damage to the wiring. Certain ranges of the electric models are supplied with a battery back-up in the rear of the motor (see main HSL catalogue). This battery is for emergency use only and will cut in if there is a power failure (it will need replacing after this). The battery will have a life-span of approximately 6 months in stand-by mode and therefore must be changed regularly. Important: The battery back-up is a safety feature to return the chair to a sitting position in the event of a power cut. It will only operate a limited number of times, after which the battery will need to be changed. At HSL we know that people’s health changes all the time and that some conditions progress much quicker than others. If you have a medical condition that could affect the way you move about, how you think, your understanding of everyday items or your ability to understand how to do things, even occasionally, then you may need to seek additional help with making sure the chair remains safe for you over time. Do you understand how to operate the chair/are the controls clear? In a neutral position the chair looks like any other chair. 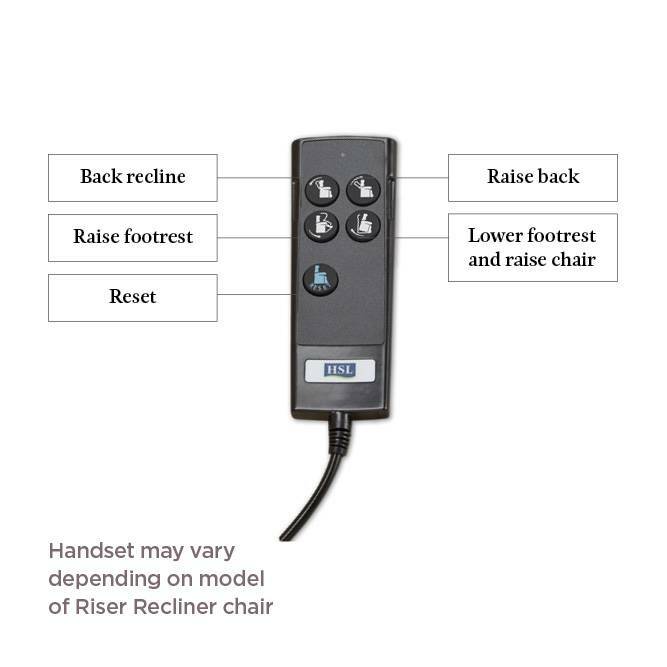 To operate the rise or recline function, the chair has to be connected to a power supply. Ensure any power leads will not cause a tripping hazard and the control unit needs to be stored safely at the side of the chair so it is accessible if needed. When rising, your feet should be flat on the floor and you should be able to support your own body weight. If you have left the chair in an upright position, when returning to a seated position you will need to support your own body weight until the chair has returned to a neutral position. When reclining the chair, ensure you can still reach the handset at all times for further use. When in a reclined position, you must return the chair to a neutral position before attempting to stand up; failure to do so could result in a fall. Do not attempt to climb into the chair if it has been left in a reclined position, this could result in a fall. If your health problems include any type of confusional state, even occasionally, ensure you are familiar with the functions of the chair before use and get assistance from others to help you if needed. Do not lean forward in the chair when the footrest is elevated. Check that chair is plugged into the mains socket. If chair is working slowly, this may indicate the chair is working from the battery back-up system. If plugged into an extension plug, please try plugging directly into the mains to rule out a faulty extension. Try unplugging the chair for half an hour and then re plugging in to allow the chair to reset.